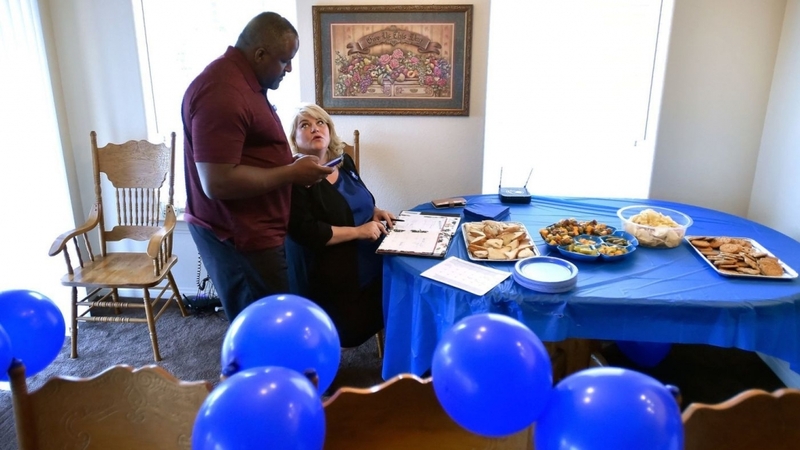 (David Montero | Los Angeles Times) – On her first meet-the-candidate night, she walked into the house and saw 18 empty chairs and three $1 bills resting in a yellow plastic container marked donations. Her name was on the bucket. It was spelled wrong. It’s not Lisa. It’s Lesia. Short for Alesia. But she’s used to this. The last name gets butchered, too. It’s Romanov, not Romanoff. Or Romanof. Occasionally, she even gets Romanob. Few people know her name anyway in this rural Nevada district where she is running for the state Assembly. She is a Democrat, and Democrats hadn’t even bothered to run a candidate since 2012, when the Republican won by nearly 30 points. But the national tide of women running for elected office — a reaction to the presidency of Donald Trump — has even reached this sparsely populated area of America whose lone claim to fame is legalized prostitution. Romanov is pitted against Dennis Hof, owner of five brothels in the state. His candidacy has garnered national attention, with late night talk shows cracking wise about it. Hof shocked the state’s political establishment in June by beating a three-term incumbent to become the Republican nominee for the seat. He calls himself “The Trump of Pahrump.” He had a reality television show called “Cathouse.” He doesn’t shy away from being called a pimp — it’s how he refers to himself in the title of his book. He’s been accused of sexual assault; is touted as a strong businessman; and, since securing the nomination, has been a source of discomfort for high-level GOP leaders. Romanov said she felt compelled to run — though she waited until two days before the filing deadline in March to make it official. The 51-year-old Nevada native is an assistant principal at Gwendolyn Woolley Elementary School, but has spent the bulk of her career teaching. She lives in a small part of the district that reaches into Clark County — Nevada’s Democratic stronghold. But the bulk of District 36 is in Nye County, which gave Trump 68% of the vote in 2016. Eric Herzik, chairman of the political science department at the University of Nevada, Reno, said Romanov’s only chance is for Hof to self-destruct in some unforeseen fashion. He did get some bad news last week when his brothel license for the Love Ranch was revoked after Nye County officials said he was late paying the fee. Hof has said county officials mail bills late, which make the payments late. It’s the second time this year Love Ranch has been closed. Herzik said simply being a Democrat is virtually an insurmountable obstacle for Romanov. Hof said it won’t be a matter of if he wins, but by how much. Romanov said she used to be a Republican, but that changed after her divorce in 1999. Romanov had also endured other difficult circumstances. There was the suicide of her brother in 2005, which gave her a firsthand look the toll of depression and drugs. In 2008, she got swept up in the mortgage crisis and had to file for bankruptcy after losing her house. She said she was a victim of predatory lending practices. She said she had thought about running for office before — she has a relative running for a judge’s seat in Florida — but it wasn’t until the mass shooting at a high school in Parkland, Fla., in February that she took the idea of running seriously. As an educator, she said, she was alarmed by suggestions that teachers should be carrying weapons and didn’t want to see that become a practice. She had participated in the Women’s March in 2017 and has been dismayed by President Trump on women’s issues. Since announcing her candidacy, she has picked up support from other women running for office in the state, including U.S. Rep. Jacky Rosen, a Democrat who is seeking to unseat the Republican incumbent senator, Dean Heller. “Democrats like Lesia Romanov are running for office in every corner of our state this cycle, and the wave of women who are stepping up to run in these tough races is incredible and inspiring,” Rosen said in a statement. Nevada has been a strong state for women in elected office, according to the Center for American Women and Politics at Rutgers University. Nationwide, a record 2,212 women are running for state legislative seats. In Nevada, women already hold 24 of the 63 seats, or 38%, giving the state the third most female legislature in the country. Arizona and Vermont are both at 40%. Kelly Dittmar, assistant professor of political science at Rutgers and scholar at the Center for American Women and Politics, said although Romanov is in a tough race, just having her running could be helpful for other Democrats competing in Nevada and beyond. Her being in the race helps shine a spotlight on the fact that the Republicans’ candidate is a brothel owner. Several Republicans in high-profile races in Nevada have refused to endorse Hof, including Heller and Adam Laxalt, who is running against Democrat Steve Sisolak for governor. Hof does have the backing of the Nye County Republican Central Committee — which hosted his watch party when he won the primary. Romanov said she knew how difficult the race would be. At the meet-the-candidate event on a hot, Friday evening in Pahrump in early August, she was met by Nye County Democratic Chairwoman Carol Little, who was also a novice to politics and got involved after the Women’s March last year. Two pizzas arrived. Little and Romanov filled out a calendar for events she needed to attend. But after more than an hour, only one person had showed up to meet Romanov — a retired mine worker. Romanov stood up and looked around. “We should get out there and knock on some doors,” she said. With temperatures still above 100 degrees, Romanov and Little got into a car and drove to some mobile homes. The sun was setting over the mountains as William Seddon answered the door. Romanov introduced herself and said she was running against Dennis Hof. “You’re the Democrat?” Seddon asked. Buoyed by that success, she found a woman standing next to the porch of her mobile home. Romanov introduced herself. Little asked if she was registered to vote. She said she wasn’t and had no interest in it. It had grown dark, and Little said they probably should call it a night. The two women hugged and Romanov smiled. “It’s a start,” she said.